As interoperability became one of HIT's top priorities this year, Centers for Medicare & Medicaid Services (CMS) Acting Administrator Andy Slavitt and former National Coordinator for Health Information Technology Karen DeSalvo, MD, MPH, MSc, pressed health care providers to make health data more liquid or risk reimbursement penalties. Private payers also are indirectly penalizing providers by capitating payments for procedures and refusing to reimburse duplicate tests when interoperability is the roadblock. As CMS writes more rules in the coming years tying clinical quality measures to reimbursements, reducing expensive imaging tests that are clinically unnecessary will become paramount, and the lack of interoperability will become less and less of an excuse. CIOs and HIM managers must prepare for this new reality and build enterprisewide interoperability strategies for clinical imaging. In a recent audit of medical image exchange by clinical specialty at health systems of all sizes (but skewed toward large academic medical centers), radiology ranked fourth, behind neurology, surgery, and internal medicine. Considering that when many health care professionals think of clinical imaging, they assume it is radiology, these results may be surprising. And why not? After all, since the 1990s, PACS and vendor neutral archives (VNAs) have been the repositories for most imaging. • in the future, demand better access to their personal health information. The fact that this is occurring means that HIM managers, IT leaders, and radiology departments must partner to create more sophisticated enterprise imaging strategies to accommodate patients' needs for image sharing across most specialties. As these trends become more evident, hospital and health system CFOs are getting involved in technology investments. More frequently, image-sharing technology is purchased at an enterprise level, driven by the CIO and the CFO. Increasingly, they recognize that major EHR technology purchasing—a budget strain for a decade—is behind them. Along the way, data storage revealed itself to be the second largest investment, an expense CIOs and CFOs are looking to better control as well. It is no longer a world where CIOs and radiologists exclusively make health care technology investment decisions, as it might have been two decades ago. Clinical leaders still have a tremendous amount of say—and sometimes their brand preferences win out—but more and more, finance is looking over their shoulders and questioning capital outlays before signing off. A survey of 100 College of Healthcare Information Management Executives sponsored by lifeIMAGE indicates that overall enterprise imaging strategies are key priorities for organizations and that many are well on their way to implementing them. • Image sharing across the enterprise is increasing in importance. Eighty-six percent of CIOs report that IT owns imaging either exclusively or as a shared initiative with radiology. • Why are they doing it? CIOs said that improving care coordination is a driver for interoperability. Still, one-half of the organizations surveyed cannot yet move imaging data between systems and applications. CIO respondents recognize that such capability is needed in many clinical disciplines, citing several departments—chief among them cardiology, orthopedics, and radiology—of particular importance. Forty-six percent of CIOs said a lack of interoperability was the biggest challenge of integrating imaging technology systems with an EHR. Some pinned this issue on vendors, some on other technical factors such as the lack of a national patient identifier. • One-third of CIOs indicated their facility may be losing revenue because of image data interoperability challenges. How do they know? Overall, the survey responses tell a story of how payers are incentivizing interoperable health data through bundled payments and other programs that reward providers that only reimage patients when it is clinically necessary. • CIOs also say that meeting interoperability objectives remains a challenge. In summary, because they are seeing how unattainable image data can negatively impact patient care, HIT executives have an understanding of what needs to be done, but they haven't yet focused on solving what they believe are technical issues surrounding image interoperability. More than 50% of respondents indicated inefficient imaging practices could lead to delays in diagnosis and care, repeating studies, and patients potentially going elsewhere for care. The overall interoperability outlook is less positive: 86% of CIOs note that improving care coordination is a driver for interoperability. However, more than one-half of the organizations surveyed cannot yet move imaging data between systems and applications. Who Needs Clinical Image Sharing First? The need to plan and implement an enterprise image-sharing strategy is clear. When developing an interoperability strategy and determining the order of implementation, experts recommend first paying attention to specialties where quick turnarounds are essential. Those clinicians will benefit the most—and probably have already developed their own ad-hoc imaging workflows. Image exchange is important in urgent care, emergency departments, and stroke centers. Clinicians working in these settings, who often face a frantic atmosphere, frequently are at the forefront of image exchange. These groups might be smaller than the entire radiology department, but they recognize how digital image exchange saves lives and tend to be progressive regarding the adoption of these technologies. 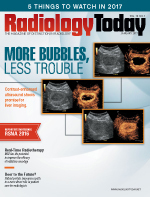 Oddly enough, despite being on the cutting-edge of imaging for a century, it's possible radiology may be the most difficult department in which to implement image sharing. The specialty is undergoing a transformation. Through no fault of its own, radiology is caught in a riptide between the old fee-for-service mentality and the new care models based on quality metrics tied to reimbursement. The specialty debates whether it should be spending more time directly with patients as a way of adding value or establishing clinical quality metrics and standards and maintaining its current level of patient contact. While radiologists work all that out, cardiology, urgent care centers, and—in a couple of years—oncology will start to say, "We cannot wait for you guys; this is not a radiology play. This is about sharing clinical info in a way that helps patients so they are gaining more influence in these decisions." Specialists outside of radiology will become more vocal about sharing imaging than they have been historically, which will drive more CIOs to take a whole-enterprise approach to imaging with VNAs as opposed to siloed systems such as radiology-specific PACS. As CIOs, HIM managers, and CFOs begin to make the implementation decisions and free imaging data in order to reap quality and reimbursement gains, the next evolution of enterprise imaging strategy will take place in the cloud. That is how health care leaders will ultimately achieve CMS' and the Office of the National Coordinator's goals of freeing health data. — Matthew Michela is president and CEO of lifeIMAGE, which enables clinical image sharing between health care organizations, physicians, and patients.